Other Products by PhD Nutrition. Search other Electrolyte Replacement products. PhD Battery +/- delivers a unique, natural hydration formula that is flavoured only with fruit. Battery +/- helps the body to achieve optimal hydration so you can both perform, and recover better. In order for muscles to function correctly they require a certain amount of fuel or energy and also correct fluid balance. PhD Battery is laden with electrolytes. These electrolyes, or electrically charged ions are able to conduct electrical currents to control fluid balance. Due to the lower osmolality of Battery +/- to blood, water is able to pulled into the muscle more effectively. Many athletes take for granted how important hydration is to muscle function. As little as 3% dehydration can cause a 12% in strength and subsequent decreased performance. If you take part in intense physical exercise making sure you stay hydrated as it is as important to your performance as any other supplement you may be using. 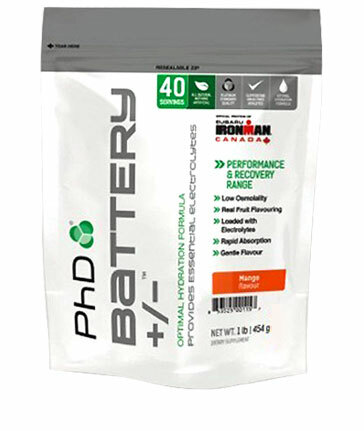 To stay on top of your game use PhD Battery +/-. Mix 1 scoop (11g) of PhD Battery in 250ml of water. Battery is best taken during training or competition to ensure your muscles are optimally hydrated. Ingredients: cane sugar, dextrose, sodium citrate, citric acid, real fruit flavour, magnesium citrate, calcium citrate, potassium citrate, ascorbic acid (vitamin C).